Join us Saturday March 9, 2019 at the Mellwood Tavern for some good-time Stonewheel! Stop by often to hear something live, an early demo, or an old treasure that never made it out of the basement! STONEWHEEL - TIL THE COWS COME HOME! The new album is here!!!! Head on out to iTunes, Amazon, or CD Baby to check it out!!! Physical copies are available as well. 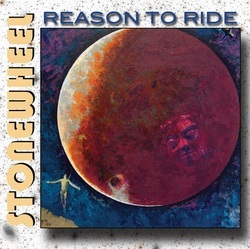 Stonewheel is also excited about their exclusive new single "Reason To Ride" on limited edition 7" colored vinyl (w/download sticker) and CD. Physical copies are available at all Louisville Area Record Shops and Stonewheel Concerts. For those online you can also find it at iTunes, Amazon, & CD Baby. Check out the video here. Thanks for listening! Stonewheel is now on Pandora Internet Radio! Listeners can create their own personal Stonewheel Radio Station and catch the vibe of The Wheel. Be sure to give us a "thumbs up" whenever you hear one of our tracks....and thanks for listening! Plus head over to the archive.org for some Live Stonewheel Shows! Stonewheel is a five piece rock-n-roll band from Louisville, Kentucky, born out of a classic American songwriting tradition and sense of community. The band was formed in November 2003 by friendship and love of music and currently includes Morgan Shallcross (lead vocals, guitar), David Taylor (keyboards, vocals), Chris Greenwell (guitar, vocals), Steve Morgan (bass) and Ben Toadvine (drums). Other Stonewheel Family members include Sean Ayres, Keith Burchett, Troy Campbell, Glen Howerton, and Mark West. The band's repertoire started as a blend of classic roots/rock cover songs (Van Morrison, Bob Dylan, Johnny Cash, The Band, Little Feat, Rolling Stones, etc.) sprinkled with a few originals. That format soon evolved into more and more originals being written and thrown into the sets over the years, eventually leading to the recording of their first record "Dashboard" (2006). The album garnered significant success with audiences and radio, attracting a new legion of fans to the fold. The song "Go For Gin" especially hit a hometown note with it's story of a betting man bringing it all home with the 1994 Derby winner of the same name. During the next stretch Stonewheel didn't let up. Picking up regular monthly gigs and appearing at regional festivals (Terrapin Hill, Peak Summit, Love Fest) only served to tighten the band's sound and strength of songwriting, as evidenced by their second release "Electric Light" (2009). Reviewer Steve Morgan writes "Shallcross' unpretentious, storyteller vocal stylings shine throughout the record" while "capturing the spirit of their stellar live performances" (Louisville Music News). The album quickly gained momentum with Louisville's own WFPK supporting the record by the addition of "Another Train Song" to their regular rotation and live in-studio appearances. Spring 2011 brought the band's most ambitious record to date. "Feel Like Yesterday" takes hold from the first drumroll and doesn't let go. This rockin' collection of originals brings to the forefront their unique brand of melodies and groove. The record helped boost sales in the US, Italy, and Germany, thanks in part to the airplay of "With You All The Way" and "Pick Me Up". Italian record store Papermoon writes "the young band of Kentucky has the class and ability to offer a very versatile soundtrack to our days", while Caru writes that "the Stonewheel shall bring a perfect cocktail of rhythm, melody and groove". In addition, "Feel Like Yesterday" has recently become part of the Pandora Radio Genome, so head on over an create your own Stonewheel Radio Station. December 2013 saw the release of a new single, "Reason To Ride", on limited edition 7" colored vinyl (w/download sticker) and CD. The song shows an introspective side to the band with a dedication to a recently departed friend. Fall 2014 brought the arrival of a brand new full-length record "Til The Cows Come Home", a whole new blend of acoustic melody, pop, rock, and jam. The 11-track album was recorded over a two-year period at Louisville’s Downtown Recording, using a selection of vintage gear that included a Neve Melbourne console. The album’s cover art, inspired by a scenic drive past local farmland, was painted by California artist Worthington Foster, whose works have been featured on each of the band’s previous three albums. The leadoff track "Red Eye" has been garnering some attention from radio stations nationwide and the band is currently out promoting the record with shows and appearances and is even working on new material for an upcoming release TBA. Be sure to stay tuned in and don't miss out on the Stonewheel experience!